Commercial off-the-shelf (COTS) ion mobility spectrometers (IMS) are widely used for the trace detection of drugs and explosives in security applications and are designed to be operated by non-technical users. In non-technical user mode, the detection algorithm of the COTS IMS evaluates the sample data against the programmed parameters for a specific and limited list of target substances, and reports if any of the programmed target substances are detected. The simplicity in operation is offset by the loss of analytical information available from the spectral details. In this work, we present for the first time a COTS IMS being operated in technical user mode in the field, analyzing packages selected for customs examination. 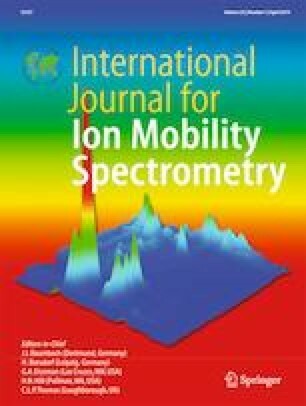 The COTS IMS was used in combination with a Fourier transform infrared (FTIR) spectrometer to evaluate the effectiveness of presumptive field testing. Three case studies are presented to demonstrate the usefulness of operating COTS IMS in technical user mode: to corroborate results obtained from the FTIR, to indicate the presence of unprogrammed substances, and to indicate the presence of substances in minor to trace amounts that were not identified by the FTIR. This work also demonstrates the use of IMS in negative mode to identify the citrate salt form of a drug. The authors would like to thank the Border Services Officers from the CBSA Vancouver International Mail Centre for their cooperation on the pilot project, and the Contraband Analysis Section of the CBSA for conducting laboratory analyses of the seized samples used in this study.